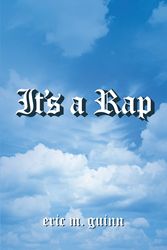 Eric M. Guinn’s New Book “It's a Rap” is a Real-world, Rhythmic Piece of Literature. Recent release “It's a Rap” from Page Publishing author Eric M. Guinn has many intense and enjoyable rap stanzas that are sure to tingle the readers spine. Eric M. Guinn, a Colorado Native now living in Florida, and devoted writer and author, has completed his new book “It's a Rap”: a gripping and potent work that shines light on many of today’s issues. Published by New York City-based Page Publishing, Eric M. Guinn’s pulsing tale will rock the reader to the core as they enjoy the rhythm of the raps. Readers who wish to experience mesmerizing work can purchase “It's a Rap” at bookstores everywhere, or online at the Apple iTunes store, Amazon, Google Play or Barnes and Noble.